Fired up the new stove in the cabin. Other than the stink of curing, it worked really well. Took about 2 hours to get the requisite 3" coal bed in the bottom to turn it over to high-efficiency re-burn, but the thing was frozen to begin with after all! It warmed up the interior of the cabin to "comfortable with jacket" temps; but everything is still uninsulated and unsealed and dead cold so it would take us a few days feeding the fire 24/7 to thaw everything out and get it above freezing in there. We're going to try temporarily sealing things up without temp-sensitive caulks and foams, and then get the insulation blown in... see how that works... because we can't afford the wood to be heating two drafty domiciles at once! Hopefully we'll get the insulation in next week (fingers crossed!!!!). The weather is not cooperating... either it's too cold to work, or it's warmer but snowing too hard to work! And we knew that we were finally getting the "clean" burn from the stove when the smoke got almost clear. Hey, at least we know that the chimney works, there weren't any SNAFUs in the flue installation, and that we have really really good draft in that stove. Seriously, the damper has to be completely closed before the smoke will backdraft into the room... and who's stupid enough to open a stove with the damper still closed, eh? ROFL But, man, with the door closed and the draft and damper fully open, that sucker roars like a freakin' freight train! 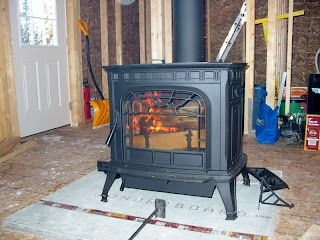 Which is so awesome after fighting with non-flammable wood in the little tent stove all this winter. And Ripley's finally big and strong enough to start earning her keep. 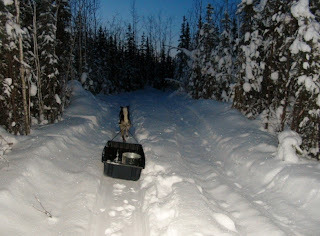 It took her awhile to get used to the harness, and she still sits down anytime there's any significant weight behind her... but she does pull the sled and seems happy doing it. I think after we have her pulling and empty/light sled or helping her with the heavier loads for a while, she'll get the idea that if she's harnessed up she's supposed to PULL whenever Mommy & Daddy tell her to go. She seems to do ok, even with heavier loads, as long as one of us is walking next to her, or there's one in front and one following... she just gets a little confused and distracted when it's heavy and we aren't giving her constant direction. We'll have to build her a cart with wheels for summer, just to keep her in shape. Saves gas in the ATV and a few hours towing eventually tires her out enough to get some quiet time in the evenings -- which is a blessing unto itself LOL. 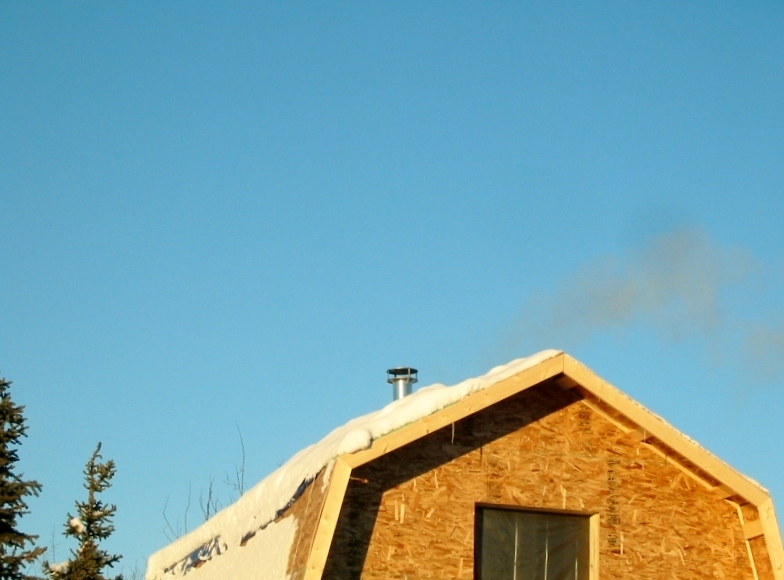 Wow, Blowing insulation? You be brave than I am. So does that mean that you have to still put up some kind of wall board? Bummer. Hi, from West Texas! Right now YOU are warmer than we are here! It is 5* and is to get below zero with a windchill factor of about -16 by morning. And this is the second week of this. I have been enjoying your blog...have read ALL of it before Christmas and check almost daily for updates. I am living in Alaska vicariously through you...I am now too old to be doing what you are doing, but really wanted to when I was younger. I love the way you go into detail about your experiences. I wish you the very best in your endeavor and look forward to being with you step by step. So glad your stove is working out for you. I was in AK in 2008 and will be going again this coming September. I'm impressed. You two are getting a lot done despite the harsh weather. Or until the first moose appears and she decides to take off after it...lol. Cool on the stove. Glad it's working well. Oh your first woodstove fire! Congrats you two,and Ripley helping out with the sled and keeping the moose at bay, you did it. I remember your drawings of your cabin and there it is. Well you have any electric power? Maybe solar? Soon you will be putting out your garden, have you ordered or saved seeds to get them started inside? And when will you be doing that? Most of the states can relate to how cold you have and how it would be living in a tent, altho most would not, lol. I did in the winter time with snow so I know how glad you are to have your cabin, we were we so very happy when we built ours. Take good care and know you have been in my good thoughts and prayers the whole time. So very happy for you folks. I forgot to add in my comments about wood burning. How may cords of wood do you guess you'll be going through a season? How much did you go through in your tent living? Your blessed to have all that wood to cut but in the town parts of your area how much is wood going for? Here we live in the woods with lots of trees to use for our heating but I'm starting to buy it instead for $95 a cord and save our trees for harder times and just use the wind damage limbs. I know you are mostly pine but do you have other types of tree? I spent quite some time trying to heat the stump ranch before I got everything closed in. Never, really managed to do much beyond attempting to the forest (even with things closed in with plastic). Once the the insulation was put in all the air gaps...amazing, temperatures went through the roof and it was easy to maintain. In the end, trying to heat without insulation wasn't worth the effort. Hope you figure out how to get things tightened up in the cold. I believe I remember when you first had the wood stove on your truck and had a flat tire. Unloading to fix the tire was a struggle but I bet right about now your thinking it was worth the aggravation and work. Glad to see it working for you. Hang in there summer is coming! It’s great to follow your adventure. Hey Tom - yes, we're blowing DENSE PACK cellulose insulation (3.5 psi)... lesser folks weep at the fluffy stuff they blow into attics LOL. But seriously, we'll end up with close to R-40 in the walls and R-60 in the floor and roof, so it's totally worth it. Linda - no electric at the cabin yet other than toting the generator back and forth. Once we get the insulation in and can keep the place heated, then we'll move our new big batteries in. Hopefully if the tax man doesn't dig a hole in our pockets again this year, we'll be able to get a couple solar panels and give the generator a bit of a break. $95 a cord is about half what we'd pay out here for seasoned, cut and split delivered to the side of the highway. We **might** be able to get green 8-footers for that low from a buddy **if** we picked it up, cut it into stove lengths, and split it all ourselves. But we'd pretty much have to clear cut our property to run out of trees for firewood in our lifetime. I'm pretty sure that we have enough dry dead standing fire kill out there right now to last us a decade if we just went out and collected it all. 80 acres is a LOT of wood ;) We really only need to buy birch for now since most of ours are on the small size and we need to thin out the little spruce saplings to let the birches grow and spread. We'll be spending a good chunk of time the next few years just doing woodlot management. I hope to get some sort of garden in this year. I do have a lot of seeds saved, and they're up in storage in Fairbanks. Last frost is the first week of June, so I can start my cold tolerant transplants indoors in mid-April after the inside of the cabin is finished and we're all moved in. I know a few folks who jumped the gun and have already planted their starts... with nowhere but 2 feet of snow to plant them out in right now. Looking good - love the looks of your cabin and stove! We live in a 100 year old farmhouse and have had inside woodstoves over the years. Last year, we installed an outside woodburner. We own woodland so we have lots of "free" firewood. Thanks for posting - enjoy reading your blog! I don't post comments often. Just want you to know, we follow your journey and wish you all the best. Take care now! As a way of suggestion, Id use paper faced insulation and visqueen after you have stappled up your insulation. Vapor barrier is So important in staying warm. blown in insulation gets damp no matter what, and settles and you have a cold house. (my family has been in insulation biz for decades) If I wasnt such a baby about the cold now Id be up there too. Looks great!!! I'm so glad everything is coming along so nicely. Blown insulation only settles if it's not blown in under pressure (dense pack will settle... eventually). The same way that if backed batts come off the backing or come off the staples they'll settle too. However dense pack cellulose has a higher R value per inch than backed batts, and I happen to be extremely allergic to fiberglass which would make installation a lot more difficult. Rockwool batts may work if we could have found them here for a reasonable price. All insulation has the possibility of getting wet, regardless of the type with the exception of expanded polycyanoacrylate polyurethane or polystyrene that is spray on, rigid or closed cell insulation that is non-permeable and un-punctured. That's why we have siding, wrap, and sheathing. All bulk water should be shed, so that leaves condensation from the interior which should be handled by the vapor barrier. I don't think using paper is a very good idea, unless it's treated to avoid moulding, even with all the precautions moisture can enter the wall structure, where paper will mould. The cellulose is treated so that it's non-moulding, so we'd only need to worry about the dimensional lumber and sheathing which is the same as any wall structure(if the drywall gets wet, we can at least cut out the section and replace it). Since we have a 2' overhang on the gables, and will have 4' porches just under the eave line on the sides the chances of having so much bulk water flooding the sheathing that we're going to have problems with the external wall structure are minimal. This is especially true with the climate here, where the annual rainfall is 15" per year. I hear u about the insulation thing , but just saying , Ive had to reblow walls before that were not blown right, but never had to rebatt. cellulose? are u alergic to those batts? they make denim batts now too. plus no mold if u use visqueen, and tyvek. here are the batts that would work well with yer place. cheers! Just a quick note to say that with all the preposterous mayhem breaking loose globally, if ya'll had any doubts about your move to the A-K (which I doubt), they should be shrinking to mere whispers of vapors of specters of second thoughts. Please note I didn't use the word regret, because I don't reckon ya'll are the type to indulge in same. Rock on! And VIVA!